When do the choruses rehearse? All Choirs will begin rehearsal the week of August 21, 2018 and continue through beginning of June 2019. All choirs meet one time per week. 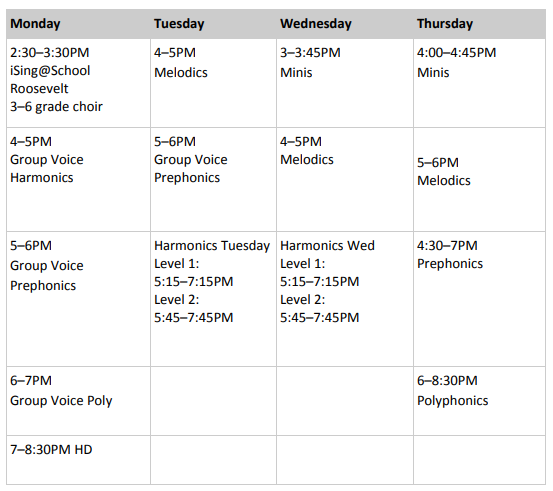 We offer several class times for Minis, Melodics and Harmonics. We know that our iSing girls are involved in many exciting extracurricular activities. We do ask that you prioritize iSing's weekly rehearsals. We send home practice information and ask students to practice their songs at home. How often do students perform? All singers perform in two large concerts: iSing's Holiday and Spring Concert. Polyphonics and HD perform frequently throughout the year. Interested singers should sign up for an audition using the audition link, provided here. iSing offers tuition assistance to families who are unable to afford tuition. This option is available to all families who are able to demonstrate need and commitment. Please email info@isingsv.com for additional information. Tuition assistance applications are due by August 31, 2018; tuition assistance notifications will be made on September 10, 2018.
iSing Silicon Valley is a 501c3 nonprofit organization. Your tax-deductible gift supports our mission of girls changing the world through song.